Denver’s fastest growing chapter of the American Needlepoint Guild swings back into action after a sweet summer of stitching at home. The Colorado Columbine Chapter, based in Denver, has a whole new slate of programs getting underway. SEPTEMBER 21: A delightful design, all sparkly and wintery, is planned for CCC-ANG. 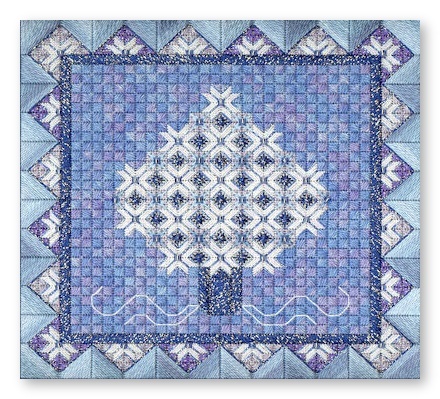 See the piece, above, called ‘Snow Crystal Tree’ by Nancy’s Needle, which will be taught by Barb G.
Cost is only $15 for directions and beads (!) and signups are closed, so the early birds are the lucky ones this time. Design size is 8.3″ x 8.3″ on a 14″x14″ canvas. It will be a fast stitch. The design shines as a winter piece, not necessarily holiday themed.